SWCC holds commencement exercises each Spring in the Charles R. King Community Center gymnasium. Candidates for graduation should arrive at the King Community Center no later than 5 pm. Commencement ceremony begins at 6pm in the gymnasium. Candidates for graduation who will complete their programs during the summer term may apply for spring graduation by April 1. If you do not plan to participate in the graduation ceremony, please indicate this on your Application for Graduation. Your diploma will be mailed within 45 days after the date of graduation. All graduates are encouraged to attend a commencement exercise. –Summer Term graduates may participate in the prior Spring term commencement exercise. –Fall term graduates may participate in the following Spring term commencement exercise. See the Student Handbook for more information on graduation requirements and Graduation Honors awarded. 2018 Graduation was a Grand Time at SWCC! 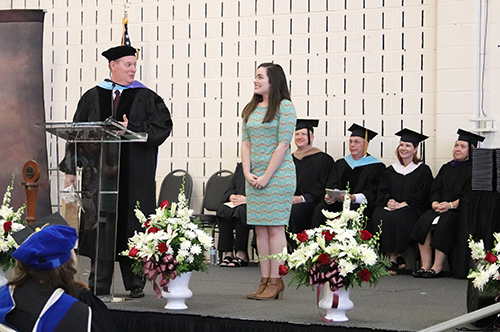 Dr. Tommy Wright, president of Southwest Virginia Community College is shown congratulating Kenna Adkins, the college’s Student Government Association president, after her memorable address to the 2018 graduating class. Adkins was selected by Dr. Wright to be the commencement speaker of the first graduation of the college over which he presided. He felt that it was important that a student speaker address the graduates this year, as it made it clear that they are at the heart of Southwest’s mission to provide world-class, affordable, higher education and workforce training to the people of our region. Southwest Virginia Community College honored its 484 graduates at this year’s commencement ceremony with a bang! There was so much new about the college’s graduation that it created excitement among the graduates, faculty, and staff that could be felt among the 2,000 plus friends and family there to recognize their graduate’s academic achievement. It was an exciting night of firsts. Dr. Tommy Wright, the new president of SWCC, presided over his first graduation at the college. The new stage on which graduates received their degrees, diplomas, and certificates, featured easy-to-access ramps for those who had difficulty with mobility. Those in the audience who are hearing-impaired also found more accessibility to the graduation proceedings, as a new feature was added, an American Sign Language interpreter. For the first time at a SWCC graduation, those who were unable to hear, could see their loved one’s names being called as they stepped forward to receive their academic credential. The college’s policy of inclusion for all, was evident during this celebration of SWCC graduates. But, the best was yet to come. At the conclusion of the ceremony, Dr. Wright, the faculty, and administrators, formed a line on both sides of the exit door. When the graduates exited, they were met by congratulations, high-fives, handshakes, and hugs. Although they were no longer students, they had joined an exclusive group of individuals known as SWCC graduates. They were now SWCC alumni. Adkins spoke about the fact that life can take you down a path you were not anticipating. She went from a very quiet, self-conscious girl to an extra-curricular juggernaut at Southwest. “It wasn’t until I started college at Southwest that I found my voice,” said Adkins. “When I first started college, I had never really planned to be active in extra-curricular activities.” At the time of her second year in college, Adkins held a number of positions on college clubs and organizations, including: SGA Senator, Art Club President, and Phi Theta Kappa reporter, which is the honor society for two year colleges, among many other positions, awards, and honors. The college also announced the 2018 Distinguished Alumnus award recipient, who was introduced by Victor “Jordan” Wampler, currently the president of the college’s Upsilon Upsilon Chapter of Phi Theta Kappa. John Marco Warner, who is the vice president of sales, co-founder and a principal of Trustpoint Insurance, LLC was this year’s recipient. A special honor was given to one of SWCC’s own during the evening. Dr. Ron Proffitt, interim vice president of Academic and Student Services, was given words of appreciation for his 43 years of service to both SWCC and the Virginia Community College System. He served as a program director and instructor of radiologic technology (1975-2000), as dean of the math, science, and health technology division at Southwest (2000 – 2007) and his subsequent years of service as both the vice president of instruction at Wytheville Virginia Community College (2007-2010) and as president of Virginia Highlands Community College (2010-2017). “Although I have only had the pleasure of working with him for five months, I have already seen first-hand his kindness and his dedication to our students, faculty, and staff,” said Dr. Wright. He continued, “The Local Advisory Board authorized the college to honor Dr. Proffitt’s legacy by creating the Dr. Ron Proffitt Radiology Lab.” As an additional honor, a scholarship was established to recognize his career and contributions to Virginia higher education. Those who are interested in supporting the scholarship may contact Susan Lowe, executive director of the SWCC Educational Foundation, at 276.964.7304, or susan.lowe@sw.edu. There was a more somber note during the night’s celebration, but one that was dear to the College’s heart. Darrell Shortt, a SWCC student who had passed away unexpectedly a bit earlier in the year, was awarded a Career Studies Certificate in Cybersecurity. His daughters Chelsea and Adriana, joined the platform party on the stage, to receive his degree. Among the people in the audience was Shortt’s wife, Barbara, as well as, other family members. In addition, Elaine Hardin, site director of Old Dominion University, which is SWCC’s longest distance education partner, conferred degrees upon the ODU students in attendance. Scott Butcher, chair of the SWCC Educational Foundation, gave the invocation. Susan Lowe, executive director of the SWCC Educational Foundation, welcomed the class into the ranks of the college alumni. Members of the SWCC Wind Ensemble, under the direction of Dr. Joseph Trivette, provided the music. The College’s Community Chorus sang the Alma Mater, words by Adda Leah Davis. Many other members of the college community also worked diligently to make sure commencement was a success for the graduates.